"We are thrilled to welcome such an influential group of companies as strategic investors, with whom we share a common goal of making mobility safer and more efficient," stated Charles Boulanger, LeddarTech’s CEO. "Their strong endorsement is a testament to the maturity of the Leddar technology and the credibility of our product roadmap to support the ongoing development of autonomous driving. 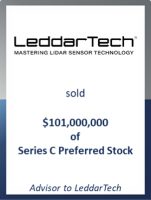 We believe this announcement represents a major stepping stone towards achieving market-share leadership in the multibillion-dollar automotive LiDAR market by 2020."